So why should you be excited about this? Well, because it makes sharing custom tools or macros incredibly easy. You may have come across a .yxi file already if you’ve installed the google sheets connector tools, or the text analytics tool – both are installed with the help of a yxi file. In a nutshell, a yxi file is simply a (zipped) package of a tool and all its underlying components. When it is opened with Alteryx, all these components are saved to the correct location on your machine. This enables you to use the tool just like any other tool from the tool bar, hence a yxi file is an ‘installer’. 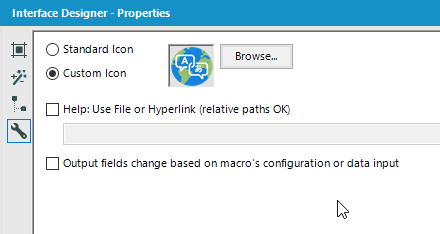 Currently, macros with supporting files are shared to the Alteryx gallery in the form of a yxzp. A yxzp is also essentially a zip file that contains the macro and all the supporting files (assets). When someone wants to download and install it, they must ensure that they place all the supporting files into their macro repository, such that the macro correctly references its assets. This can be somewhat cumbersome; whereas a yxi installer makes the installation of the macro/tool and its supporting files seamless. So firstly, what is a yxi file, and what’s in it? Great, but what does Alteryx do with it? So here’s the bit which saves us as users tons of effort. 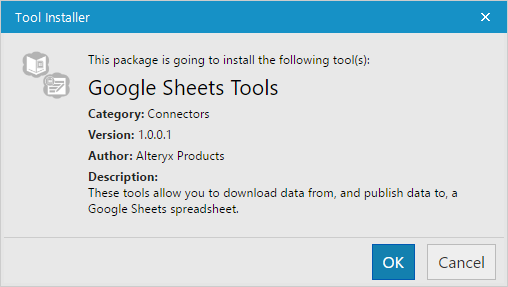 When you open a .yxi file in Alteryx, it will give you a nice pop-up telling you some information about the tool or tools you are about to install. Note that you’ll need to show hidden folders as AppData is a hidden folder. In here you will find the folders for any tool you have installed using a yxi file – you can see I’ve installed a few. Opening up any of those folders, you’ll find exactly what was in the .yxi package. Now you get a real sense of what exactly all the fuss is about. You can build a tool as complex as you like, whether it’s a macro with lots of supporting macros, or a tool built using custom code with the Alteryx Software Developer Kit. When you then share your tool, everything is packaged up and installed seamlessly, without your user having to see the pieces behind it or risk partially installing them somehow. Cool! So how do I make my own? This is where it gets fun. We need to strip the yxi back to its most essential pieces and reconstruct it with our own macro. In my case, I wanted to create an installer for a text translation macro I had built, that relied on a nested batch macro to work properly. 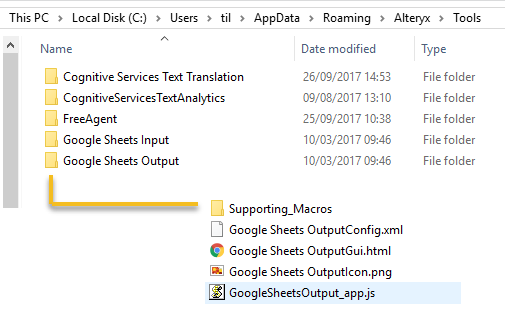 In the interest of keeping things simple, I won’t go into detail with a more complex example using html/js files – take apart the google sheets tools for yourself if you are interested! The general ‘take it apart to see how it works’ approach is applied here. 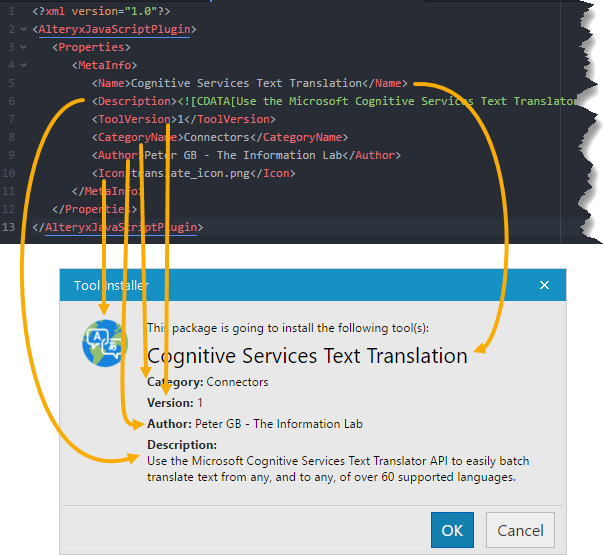 We can see exactly how the Config.xml relates to the pop up Alteryx gives you when opening the .yxi, so be sure to edit each part to suit your needs. This affects where the tool shows up in the tool bar, and what information is displayed on the hover. In my example my main macro uses another macro that handles the API calls. I opened the main macro .yxmc in a text editor, found the reference to my supporting macro, and edited the path such that it is relative and points to the Supporting_Macros folder in my soon-to-be yxi package. Now make your zip file. 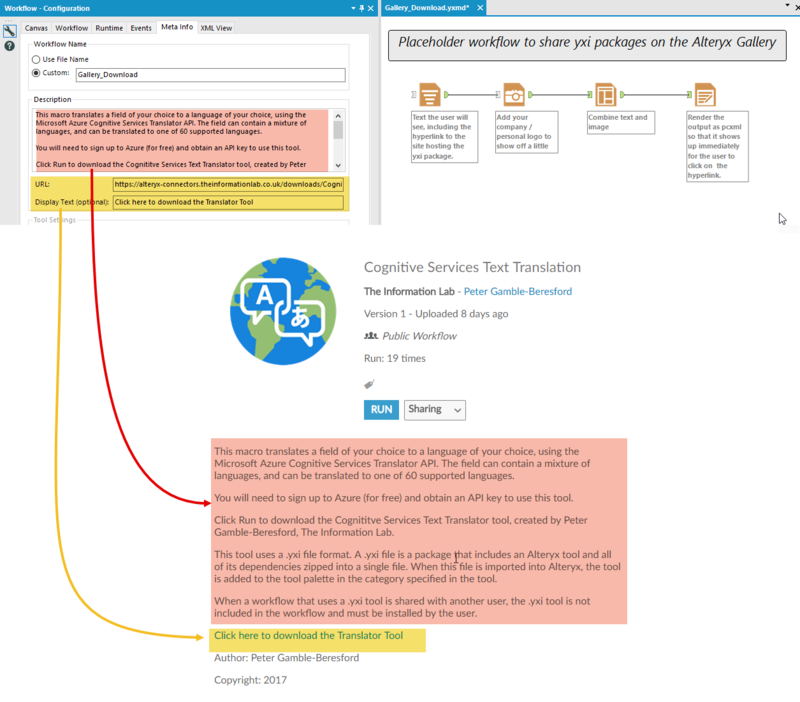 Important- Do not compress the folder containing your folder structure, as this will create an extra folder in the package – Alteryx will not be able to find the Config.xml in this case. Instead, highlight everything you need to be in the top layer of the package as in the gif below. Don’t forget to change the .zip to a .yxi and finally you have your installer package. Test it out with alteryx and check your installer pop-up appears with the correct information, verify the tool works correctly, and you can even check in the AppData folder to see that all the components were installed correctly. Great! – How do I share it? Alteryx gallery currently doesn’t really support sharing of yxi files, so you make a dummy workflow (so you have something to share on the gallery), and self-host the yxi. The user then gets a download link. This was a manual way of creating the file in order to learn what exactly it is and what it does through trial and error, with some pointers from my colleagues! 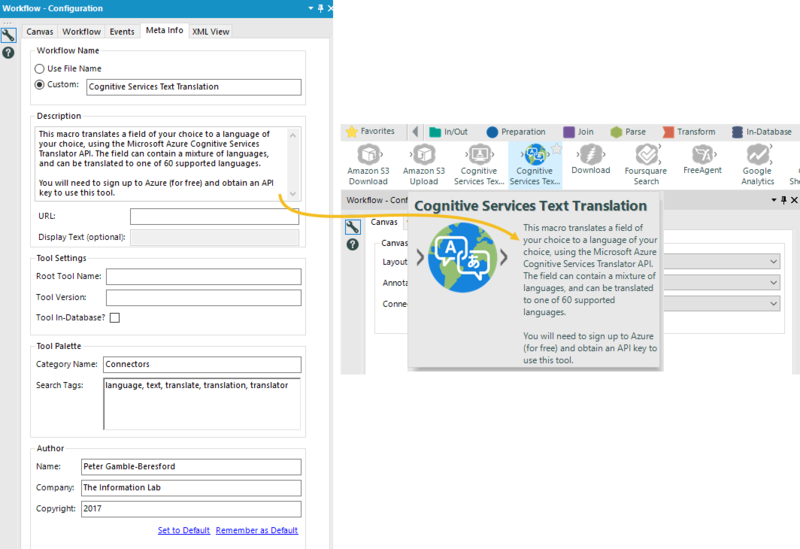 Alteryx wizard James Dunkerly has actually automated the process in a powershell script in case you’d like to use that, you can find it on his blog here. I hope you go on a multi-year blogging expedition because you are a great writer. I really enjoyed that article. Thanks for sharing that information as well as the other reference materials. Awesome blog and very helpful. You mention the install diectory to be in the %AppData% area. Is it possible to change where the install path should be? I am looking for a way to install macro’s to the “C:\Program Files\Alteryx\bin\RuntimeData\Macros”, as it makes things easier to maintain having all macros in there.